How to Convert video.mp4 to video.avi with Avidemux? I have tried several times but unfortunately the video is too big(6.22GB)! What would be the step by step procedure to be used to get an AVI format? Re: How to Convert video.mp4 to video.avi with Avidemux? What video compression are you wanting to use for the video stream in the AVI? AVC is HQ/high compression codec. So using anything else will increase the video stream size. I presume you want to use an AVI container because you have some old playback device that doesn't support the MP4 container. Do you understand the difference between the stream compression format and container format? The container does not compress either the video or audio streams. It packages them together and syncs their playback. It may also contain some extra streams, like subtitles. 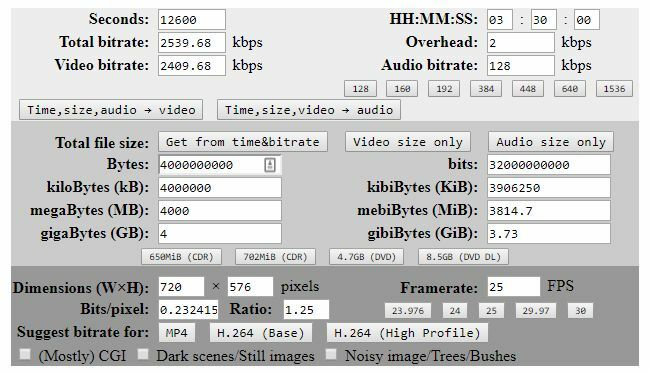 Video: MPEG2 (ff) which means it is using the MPEG-2 encoder from FFMPEG. Audio: MP3 (lame) i.e. uses the LAME codec. File | Save: give it a name and destination to suit. First off: try a 1 minute portion test encode and view it. Make sure that the AR (aspect ratio) is OK.
That you can accept the quality of MPEG-2 at 2400kbps. (MP2 is less efficient than AVC.) If unhappy, try MPEG 4 ASP (ff). Check with Mediainfo that that the video stream bitrate is very close to the bitrate you requested. Check that your playback device can play this AVI. Check that the audio is in sync with the video. If not, you may need to apply a time "Shift" offset in ADM. Start with about +/-200ms. Then encode the full thing. Hopefully it will just fit. If the playback device can not handle a 3.72GiB AVI, split it at the half-way point into two 1.66GiB AVIs. Many thx m8.What would be the procedure for testing the test encoding on Avidemux 2.7? "try a 1 minute portion test encode and view it. " What would be the procedure for testing the test encoding on Avidemux 2.7? Don't use ADM to test the playback as it will playback both AVIs and MP4s. By the way, what is this problematic playback device?